Want to connect with Absalom? Singles to large groups, weekly meal planning. Vegan, Cajun, creole, Italian, Mexican, farm to table, baking,southern, comfort, soul, BBQ grillingand more. 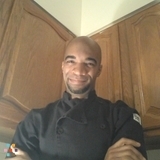 Food Network Competing Chef and Executive Chef of The Tasty Alternative providing personal chef services in the DMV and NC!